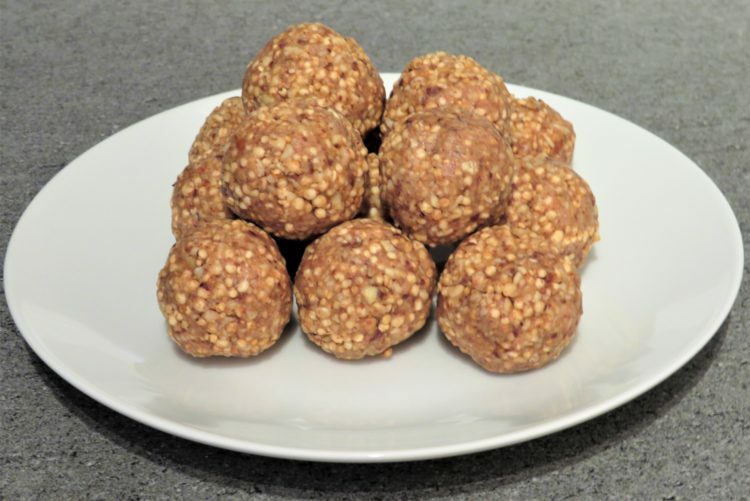 These protein balls are simple to make and are great for a quick snack. 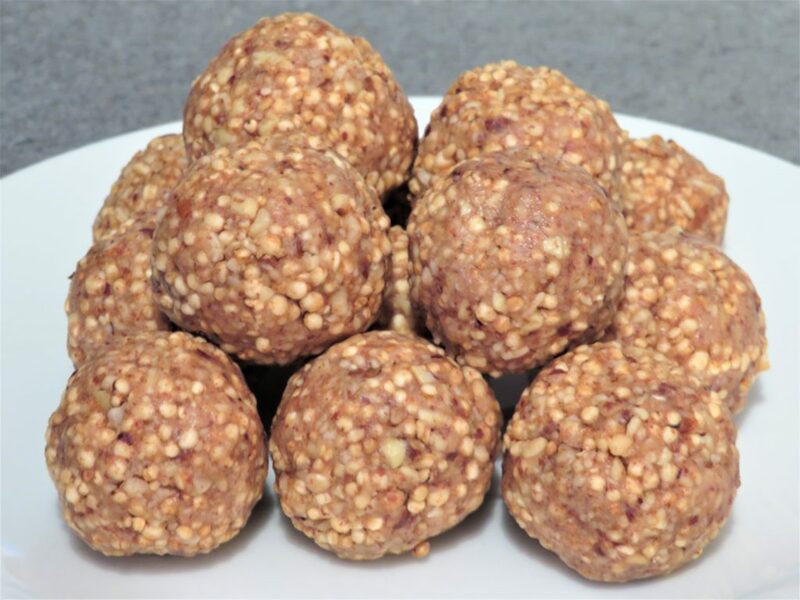 Packed with protein these balls may be little but will give a big punch to your hunger pains. 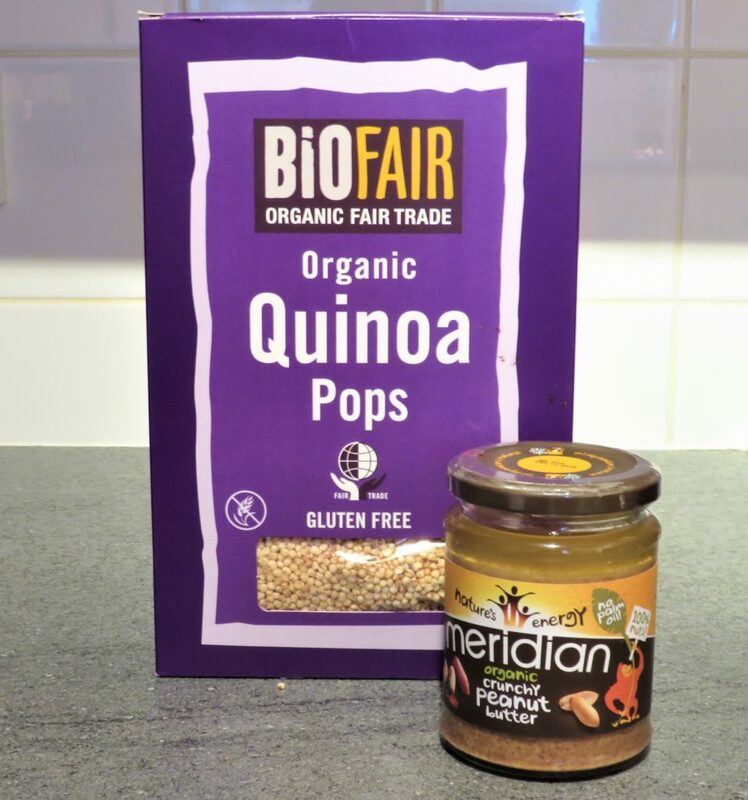 1 Place the popped quinoa and the chopped nuts in a bowl and mix. 2 Then add the crunchy peanut butter, vanilla extract and agave syrup into the bowl. 3 With a spoon mix all the ingredients until it all comes together. 4 Then with a spoon take some of the mixture, shape into balls and place on a plate, then put them in the fridge for 15 minutes. 5 After 15 minutes, remove the plate of balls from the fridge. They are then ready to enjoy or place in an air tight container to have at your leisure. Tip: You could dip the balls into melted dark chocolate for when you fancy a bit of chocolate. Peanut butter or Peanuts are a good source of dietary protein and help lower cholesterol. They contain high levels of anti-oxidants that reduce the risk of stomach cancer, heart disease, degenerative nerve disease, Alzheimer’s, viral/fungal infections and the risk of having a stoke. They also are an excellent source of vitamin-E, B-complex vitamins, copper, manganese, potassium calcium iron magnesium, zinc selenium. When roasted, or boiled these nutrients doubled. Almonds helps lower cholesterol and are packed with vitamin-E, B-complex vitamins, manganese, potassium, calcium, iron, magnesium, zinc and selenium. Brazil Nuts although high in fat they are rich in good fats which help lower bad cholesterol in the blood and offers protection from coronary artery disease and strokes. They are exceptionally high in selenium which helps prevent coronary artery disease, liver cirrhosis and cancers. Brazil nuts are also a great source of vitamin-E, B-complex vitamins, copper, magnesium, manganese, potassium, calcium, iron phosphorus and zinc. Cashew Nut are high in calories but contain ‘heart friendly’ fatty acids that help lower cholesterol. They are packed with dietary fibre, manganese, potassium, copper, iron, magnesium, zinc and selenium. Cashews are great for your skin and eyes, also are an excellent source of vitamin B-5, vitamin B-6 and vitamin B-1. Hazelnuts are an excellent source of vitamin-E, B-complex vitamins, manganese, potassium, copper, calcium, copper, magnesium, and selenium. Vanilla contains B-complex vitamins, calcium, potassium, and zinc. Agave is related to the yucca plant. The leaf contains a sugary sap, which is a natural sweetener and has a low GI meaning when consumed, it does not have a sharp high or low in our blood sugar levels. It has anti-inflammatory, anti-bacterial and immune boosting properties. It lowers cholesterol and increases the absorption of nutrients like calcium and magnesium.